Pear cut engagement rings remain a classic choice that is feminine, simple and subtle while still being a little bit unconventional. These stones have a tear drop shape with a gently rounded end that tapers to a single point. 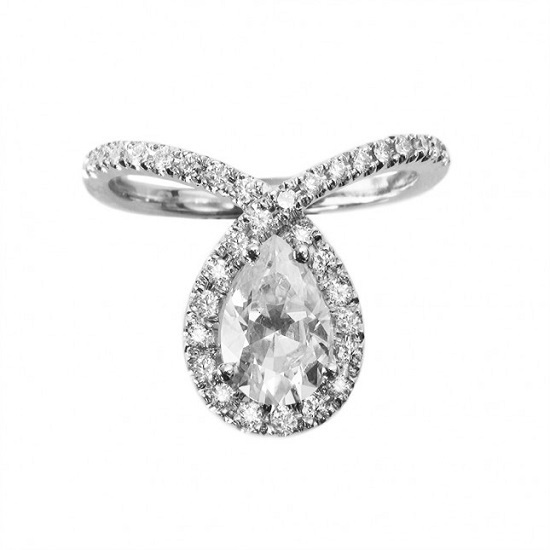 The shape of the stone maximises the carat. Some believe that the tear drop shape represents tears of happiness. If you have been daydreaming of a perfect pear cut engagement ring, prepare to be dazzled by these inspiring rings that feature this style of stone. 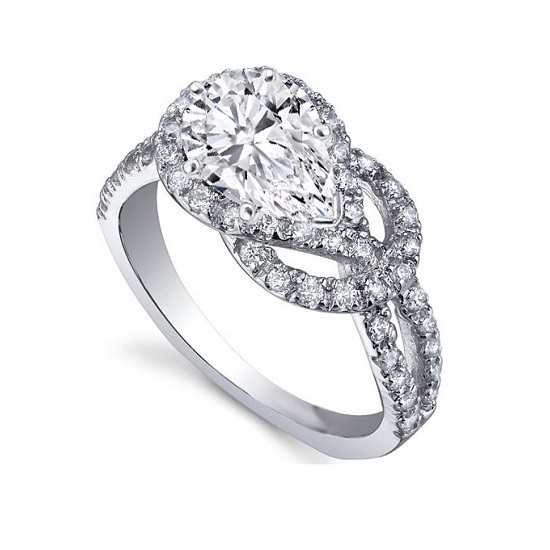 Halo settings have a band of tiny pave stones set around a centre stone. 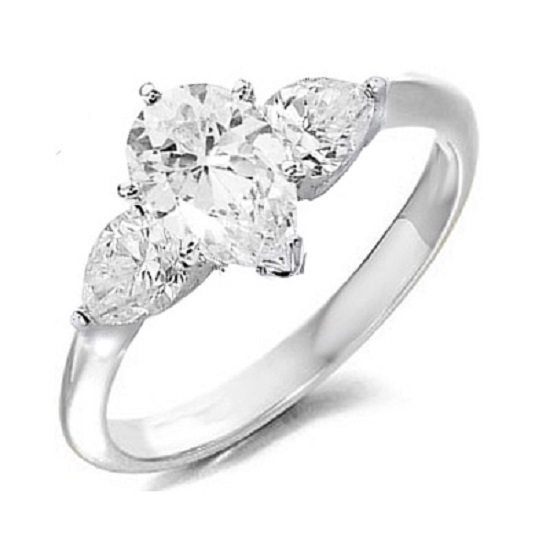 While this could be a diamond halo around a centre diamond, the halo could also surround a coloured gem stone. 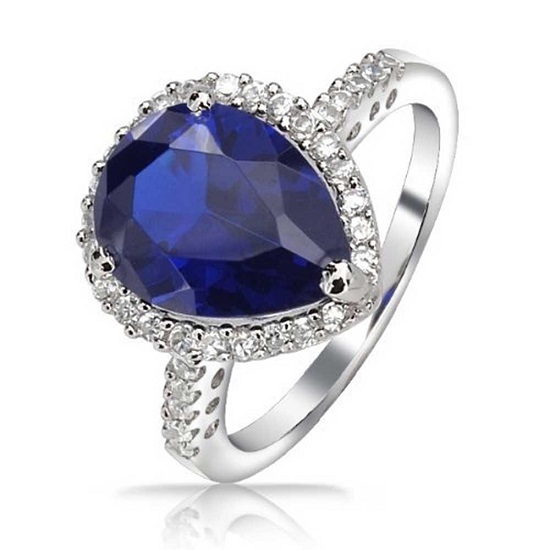 Tanzanite is always a lovely choice with platinum and diamonds, while sapphires, rubies, emeralds and coloured diamonds also work well with this style. The romantic shape of the pear cut stone is enhanced by the tiny band of pave stones, adding to the ring's sparkle. For something a bit less conventional, a love knot ring is sure to be a gorgeous choice. This ring uses the band as well as the centre stone to create an unusual setting. Pave works well with this ring, but you could also keep the band simple so that the focus remains on your centre pear shaped diamond. Mix things up by trying a two tone metal effect, or keep the band and setting in a classic metal such as platinum, gold or rose gold. If you prefer your rings on the simple side, few things are as pretty as a minimal pear cut ring in an unadorned setting. A fine band in yellow or rose gold creates the perfect backdrop for a single solitaire stone that is set to perfection. This ring works with diamonds (white, champagne, pink, chocolate, black or any other colour) as well as other precious stones. On the topic of rose gold, this warm metal works especially well when paired with a warm toned stone. Champagne and other coloured diamonds are an excellent choice, particularly when enhanced by a pave halo. 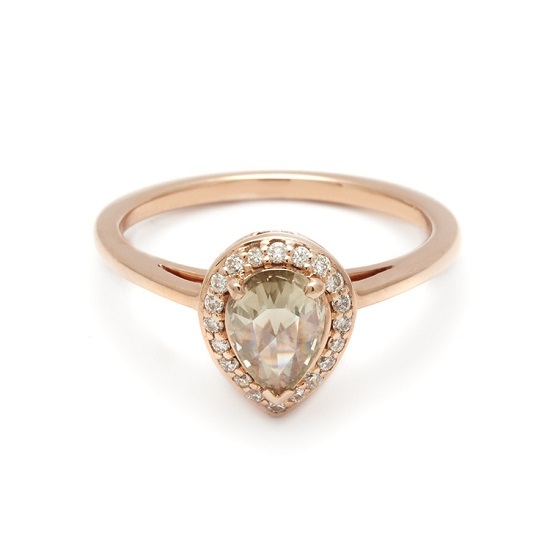 You could also opt for something like morganite that also gives a warm rosy glow. This style is soft, romantic and oh-so-pretty. 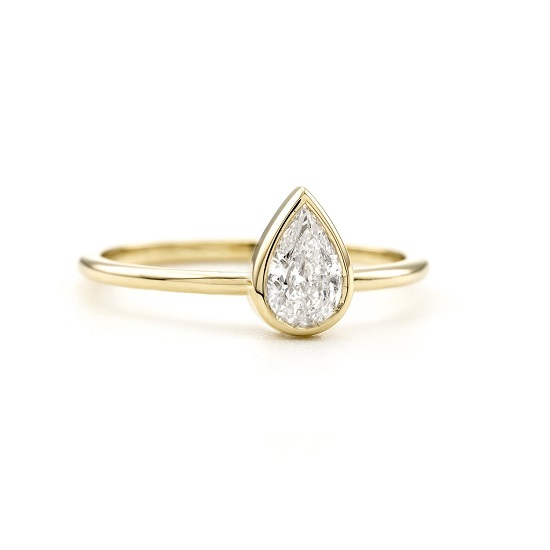 A contemporary take on the classic pear pave ring, the tear drop design of this ring is brought in through the band and the position of the stone. 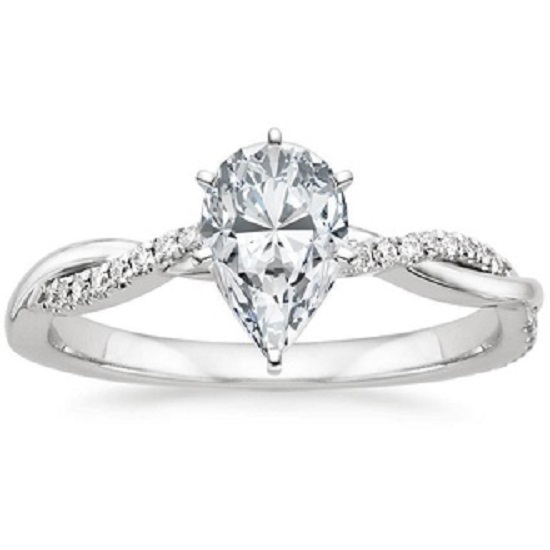 The centre stone sits further up on the finger, adding to the illusion of size and providing optimal sparkle. You can make the whole band pave, or focus only on the tear drop to make the effect more subtle. One of the most popular styles throughout the ages, three stone rings feature a centre stone that is flanked by two smaller stones. The symbolism is meant to represent the three stages of a couple's life together – the present, past and future. Pear cut diamonds add softness and a hint of vintage allure to this style. Opt for a cool toned metal and white diamonds, or try something warmer in rose or yellow gold with coloured or white diamonds. A twisted band adds detail to the ring without overpowering the centre stone. Use a pave encrusted strand to optimise the sparkle, or try mixing metals for an equally dramatic effect. In a cool toned metal set against white diamonds, the effect is surprisingly subtle and delicate. Just be sure to keep the strands fine, or you may lose some of the understated elegance. 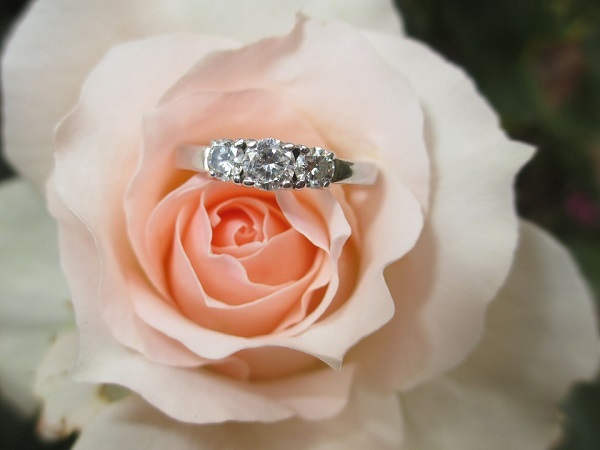 Cape Diamonds is a specialist in beautifully crafted, tailor made engagement rings made in Cape Town.